Create a safe stairs? Here you can read how to do that. A safe stairs with a non-slip adhesive strip, for you and your family. Do you also have a very steep stairs that is slippery and feels pretty dangerous? You can make it a lot safer if you like. A safe stairs for everyone, how to get started? Often the stairs is the last thing that needs to be finished after moving into your new home. When everything is renovated, painted and so on, you don't really feel like giving any energy to your stairs..
Gettting started with the stairs and renovating it is usually postponed. A lot of problems with a unsafe stairs are most of the time worn out stair-half-moon-mats or a railing that is not properly applied to the wall. Or even worse, there is no railing at all! Sometimes the balustrade on one side is removed which makes the stairs open on one side, not a very happy safe family stairs! You should be really careful when you have small kids walking around. Causes like these make the stairs very unsafe. There is no way to hold on to something while going up or down. The most safe situation is to place a railing on both sides of the stairs. On the wall side is it a good idea to take a round railing with a diameter of 40mm, this size is very suitable for children or old people who have difficulty with using their hands. On the open side of the stairs it is prefered to use a so called keyhole railing. Are you finally gonna take care of your stairs and give it a new fresh took? Then consider to paint it. Ofcourse this is a lot of work, because you will probably have to remove the carpet and the old glue, but it will be worth it. Before painting make sure you scrape of the treads so they will be smooth again. Painting the stairs is a big trend at te moment, also because paint is available in a lot of different colors. Get yourself some inspiration on Pinterest painted stairs. Your stairs will look very fresh and will have a great new look, it will be so easy to clean and no big maintenace work on it. Just clean it with the vacuum cleaner, a little wet cloth and you are all set! Another big advantage is no more dust in your hallway, so perfect for people who suffer from dust allergies. Or did you ever think of the cats and dogs with all their hairs? Super easy! 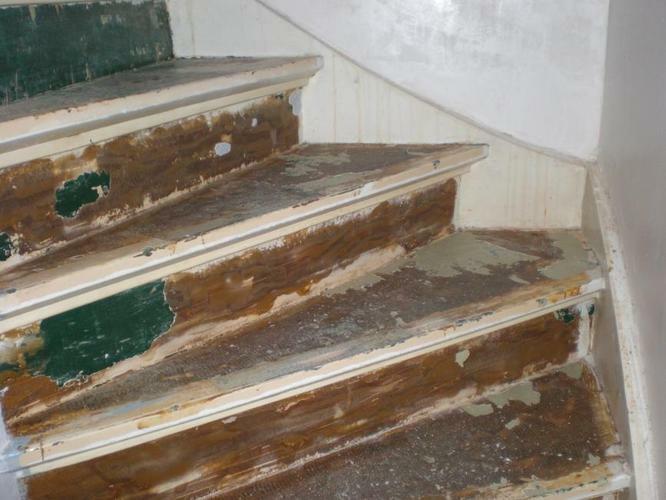 If you decide to paint your stairs, then make sure you give it a safe solution in the end. Painted treads can be pretty slippery. You can choose a non-slip strip, available in RVS. Or how about a ramping strip? Consider that there needs to be a small gutter in the treads. If you don't know how to do this, then maybe the easiest solution is to choose a non-slip self adhesive strip.